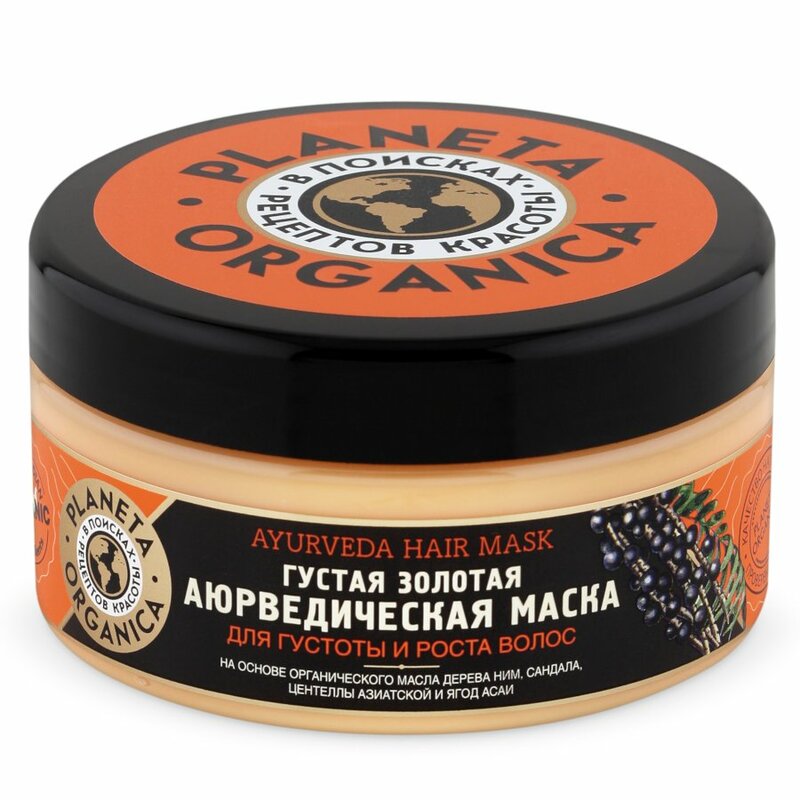 Golden Ayurveda Hair Mask is produced by the Russian beauty brand Planeta Organica. It is designed to make the hair thicker and stimulate its growth. This thick hair mask is formulated with Indian herbs that have been used in Ayurveda (traditional Indian medicine) for centuries. Key ingredients of the product include neem oil, sandalwood oil, centella extract, and acai berry extract. Neem oil is derived from the seeds of Melia azedarach, an Indian tree whose names include Indian lilac, chinaberry tree, Persian lilac, and others. It is one of the two trees known as neem, the other being Azadirachta indica. Neem oil has an antiseptic and anti-fungal effect on the scalp. It stimulates microcirculation, strengthens hair follicles, keeps hair roots hydrated, and stimulates the growth of strong, healthy and shiny hair. Sandalwood oil makes the hair stronger, prevents brittle hair and split ends. Centella, also known as Indian pennywort or gotu kola, is rich in antioxidants. Centella extract strengthens hair follicles, prevents hair loss, and helps to keep the hair strong and healthy. Açaí berry extract provides the hair and scalp with vitamins and other nutrients. It helps to restore hair structure along the entire length and makes the hair smoother, stronger and thicker. Other natural ingredients contained in the product include cedarwood oil, juniper extract and bamboo extract. Directions. Apply onto wet, clean hair along its entire length. Leave for 5 to 10 minutes. Rinse thoroughly. Ingredients. Aqua with infusions of Organic Melia Azadirachta Seed Oil, Centella Asiatica Extract, Euterpe Oleracea Fruit Extract, Organic Santalum Album (Sandalwood) Oil, Cedrus Atlantica Bark Oil, Juniperus Communis Fruit Extract, Bambusa Vulgaris Leaf/Stem Extract; Cetearyl Alcohol, Amodimethicone, Cetrimonium Chloride, Behentrimonium Chloride, Cetyl Ether, Mica, Titanium Dioxide, Silica, Guar Hydroxypropyltrimonium Chloride, Parfum, Benzyl Alcohol, Benzoic Acid, Sorbic Acid, Citric Acid. Want to buy Ayurveda Hair Mask? Call us or submit your order via our web site! I purchased it because I love everything Ayurveda. It has a very thick consistency and leaves my hair feeling moisturised and soft. But I won't say that it is very good because I have to use to much of it for my hair and the jar runs out very soon.